Philip Nelson worked from 1970 to 1982 as a research, development and consulting engineer for a UK company specialising in noise and vibration control. During this period he also graduated from the University of Southampton with a first class honours degree in Mechanical Engineering and with a PhD in Sound and Vibration Studies. He returned to Southampton to take up a lectureship in the Institute of Sound and Vibration Research (ISVR) in 1982, being promoted to Senior Lecturer in 1988 and Professor in 1994. He Chaired ISVR’s Acoustics Group from 1992, becoming the founder Director of the Rolls-Royce University Technology Centre in Gas Turbine Noise in 1999. 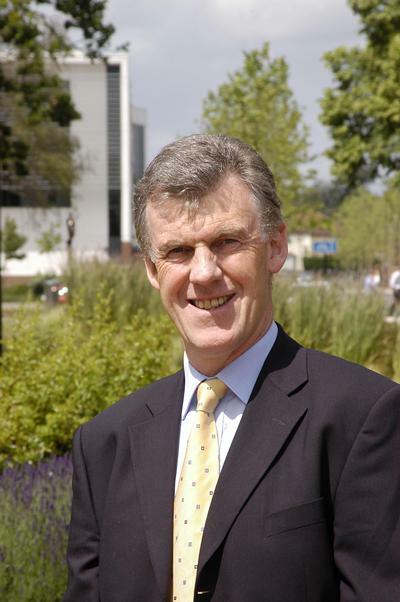 He became Director of the ISVR in 2001 and served as Pro Vice-Chancellor of the University of Southampton from 2005-2013. In 2014 he was seconded to the UK Engineering and Physical Sciences Research Council (EPSRC) where he was appointed Chief Executive Officer. He has expertise in the areas of acoustics, vibrations, signal processing, control systems and fluid dynamics. His research interests include aeroacoustics, the active control of sound and vibration, flow control, inverse problems in acoustics, and spatial hearing. He has attracted research grants and contracts totalling over £10M, many of these being industrially sponsored. He has authored or co-authored two books, over one hundred and twenty articles in books and refereed journals, over thirty granted patents and over two hundred other technical publications. He is an experienced teacher at both undergraduate and post-graduate level and has successfully supervised over 30 Doctoral and 35 Masters students. He was awarded, by the UK Institute of Acoustics, the 1992 Tyndall Medal (jointly with S.J. Elliott) and the 2002 Rayleigh Medal. He is a Chartered Engineer, a Fellow of the Institution of Mechanical Engineers, a Fellow of the Institute of Acoustics and a Fellow of the Acoustical Society of America. He was elected a Fellow of the Royal Academy of Engineering in 2002. He served on the Panel for Mechanical, Aeronautical and Production Engineering in both the 2001 and 2008 Research Assessment Exercises and as Chair of the sub-panel for General Engineering in the 2014 Research Excellence Framework. He was also a member of the Council of the Institute of Acoustics from 1991-2000 and of the Board of the International Commission for Acoustics from 2001, serving as President of the International Commission from 2004-2007. He has also served on the User Panel and the Strategic Advisory Network of EPSRC. His portfolio as Pro Vice-Chancellor included University-wide responsibilities for research, enterprise, human resources and strategic planning. He was also responsible, from 2005-2008, for the University’s submission to the 2008 Research Assessment Exercise, for strategic management of University IT systems and for all aspects of health and safety management. He was also responsible for the development of University-wide research strategy, with the particular objective of increasing research income generation within University Faculties and of stimulating cross-disciplinary research through the initiation and development of University Strategic Research Groups. He took responsibility for the University’s submission to the 2014 Research Excellence Framework. He also had oversight of the University’s enterprise activities, including the generation of spin out companies, the licensing of intellectual property and the development of relationships with industrial sponsors. He served as a member the boards of the University of Southampton Science Park Ltd., University of Southampton Holdings Ltd., Southampton Asset Management Ltd., and the Wyvern Seedcorn Fund. He also served on the CBI South East Regional Council, and the boards of Hampshire Economic Partnership and of the ‘SET-squared’ partnership of Southampton, Bristol, Bath and Surrey Universities. He has also served as a director of a number of spin out companies. Professor Nelson has particular research interests in the active control of sound and vibration, the automatic control of unsteady flow, inverse problems in acoustics with particular reference to noise source location and quantification, and multichannel signal processing techniques for the production of virtual acoustic environments. Fazi, F. M., & Nelson, P. A. (2011). Sound field reproduction with an array of loudspeakers. Rivista Italiana di Acustica, 35(1). Papadopoulos, T., & Nelson, P. A. (2010). Choice of inverse filter design parameters in virtual acoustic imaging systems. Journal of the Audio Engineering Society, 58(1/2), 22-35. Nelson, P. (2008). Book review. Beranek, L, Riding the Waves: A Life in Sound, Science and Industry, MIT Press, 2008. Times Higher Educational Supplement. Takeuchi, T., & Nelson, P. A. (2007). Subjective and objective evaluation of the Optimal Source Distribution for virtual acoustic imaging. Journal of the Audio Engineering Society, 55(11), 981-997. Zhang, X., Chen, X., Morfey, C. L., & Nelson, P. A. (2004). Computation of spinning modal radiation from an unflanged duct. AIAA Journal, 42(9), 1795-1801. Nelson, P. A. (2001). A review of some inverse problems in acoustics. International Journal of Acoustics and Vibration, 6(3), 118-34. Sunghoon, Y., Kahana, Y., Nelson, P. A., & Petyt, M. (2001). Numerical simulation of head related transfer function and sound field. Journal of the Acoustical Society of Korea, 20(6), 94-103. Tutty, O. R., Hackenberg, P., & Nelson, P. A. (2000). Gradient-based control and optimization of boundary layer transition. Proceedings of the Institution of Mechanical Engineers, Part I: Journal of Systems and Control Engineering, 214(5), 347-359. Fuller, C. R., Elliott, S. J., & Nelson, P. A. (1996). Active control of vibration, 1st edition. Academic Press. Nelson, P. A., & Elliott, S. J. (1991). Active control of sound. Academic Press. Nelson, P. A. (2007). Sound sources. In M. J. Crocker (Ed. ), Handbook of Noise and Vibration Control (pp. 43-51). UK: John Wiley and Sons. Nelson, P. A. (2004). Source identification and location. In F. Fahy, & J. Walker (Eds. ), Advanced Applications in Acoustics, Noise and Vibration (pp. 100-53). London, UK: Taylor & Francis. Hoffmann, F-M., Fazi, F., & Nelson, P. (2016). Plane wave identification with circular arrays by means of a finite rate of innovation approach. Paper presented at 140th International AES Convention, France. Olivieri, F., Fazi, F. M., Shin, M., Nelson, P. A., Fontana, S., & Yue, L. (2015). A method to improve the quality of an audio signal reproduced by a compact loudspeaker array in a private sound zone. 22nd International Congress on Sound and Vibration (ICSV22), Italy. Olivieri, F., Fazi, F. M., Shin, M., & Nelson, P. (2015). Pressure-matching beamforming method for loudspeaker arrays with frequency dependent selection of control points. Paper presented at Audio Engineering Society Convention 138th, Poland. Mattes, S., Nelson, P. A., Fazi, F. M., & Capp, M. (2014). Exploration of a biologically inspired model for sound source localization in 3D space. 1-7. Paper presented at Proceedings of the EAA Joint Symposium on Auralization and Ambisonics, Germany. Olivieri, F., Fazi, F. M., Shin, M., Nelson, P. A., Simone, F., & Yue, L. (2014). Numerical comparison of sound field control strategies under free-field conditions for given performance constraints. Paper presented at Institute of Acoustics - Reproduced Sound 2014, . Shin, M., Fazi, F. M., Nelson, P. A., & Seo, J. (2013). Control of velocity for sound field reproduction. Paper presented at AES 52nd International Conference: Sound Field Control - Engineering and Perception, United Kingdom. Olivieri, F., Shin, M., Fazi, F. M., Nelson, P. A., & Otto, P. (2013). Loudspeaker array processing for multi-zone audio reproduction based on analytical and measured electroacoustical transfer functions. Poster session presented at AES 52nd International Conference: Sound Field Control - Engineering and Perception, United Kingdom. Tontiwattanakul, K., Fazi, F. M., & Nelson, P. A. (2012). Application of the boundary element method to the design of a microphone array beamformer. Paper presented at 28th Conference on Reproduced Sound: Auralisation: Designing With Sound, United Kingdom. Shin, M., Fazi, F. M., Casagrande Hirono, F., & Nelson, P. A. (2012). Control of a dual-layer loudspeaker array for the generation of private sound. Paper presented at Internoise 2012, United States. Fazi, F. M., Casagrande Hirono, F., & Nelson, P. A. (2012). Dual-layer loudspeaker array for multiple listening zones. Acoustics 2012 Hong Kong, Hong Kong. Mattes, S., Nelson, P. A., Fazi, F. M., & Capp, M. (2012). Towards a human perceptual model for 3D sound localization. Paper presented at 28th Conference on Reproduced Sound: Auralisation: Designing With Sound, United Kingdom. Shin, M., Fazi, F. M., Seo, J., & Nelson, P. A. (2011). Efficient 3D sound field reproduction. Paper presented at 130th Convention of the Audio Engineering Society, United Kingdom. Fazi, F. M., Shin, M., Nelson, P. A., Seo, J., & Kang, K. (2011). Sound field reproduction using irregular loudspeaker arrays (abstract only). 5th International Universal Communication Symposium, . Nelson, P. A., Shin, M., Fazi, F. M., Takeuchi, T., Park, M., Seo, J., & Kang, K. (2011). Systems for virtual sound imaging. IUCS: 5th International Universal Communication Symposium, Korea, Republic of. Fazi, F. M., & Nelson, P. A. (2010). A theoretical study of sound field reproduction with a planar array of loudspeakers. 2nd PanAmerican/Iberian Meeting on Acoustics, Mexico. Fazi, F. M., & Nelson, P. A. (2010). Application of functional analysis to the sound field reconstruction. Paper presented at 23rd Conference on Reproduced Sound: Hall of Sound - Audio for Live Events, Institute of Acoustics, United Kingdom. Fazi, F., Nelson, P. A., Noisternig, M. (Ed. ), & Misdariis, N. (Ed.) (2010). Nonuniqueness of the solution of the sound field reproduction problem. Paper presented at 2nd International Symposium on Ambisonics and Spherical Acoustics, France. Fazi, F. M., & Nelson, P. A. (2010). Sound field reproduction using directional loudspeakers and the equivalent acoustic scattering problem. Paper presented at 20th International Congress on Acoustics, Australia. Fazi, F., & Nelson, P. A. (2010). Sound field reproduction with a loudspeaker array. Paper presented at 37th National Congress of the Italian Association of Acoustics, Italy. Fazi, F., Hamada, T., Kamdar, S., Nelson, P. A., & Otto, P. (2010). Surround sound panning technique based on a virtual microphone array. Paper presented at 128th Convention of the Audio Engineering Society, United Kingdom. Fazi, F., & Nelson, P. (2010). The relationship between sound field reproduction and near-field holography. Paper presented at 129th Convention of the Audio Engineering Society, United States. Fazi, F. M., & Nelson, P. A. (2009). A multi-channel audio system based on the theory of integral equations. 157th Meeting of the Acoustical Society of America, United States. Fazi, F., Nelson, P. A., & Potthast, R. (2009). Analogies and differences between three methods for sound field reproduction. Paper presented at 1st Ambisonic Symposium, . Shin, M., Fazi, F., Nelson, P. A., Lee, S. Q., Lee, H-Y., Park, K-H., & Seo, J. (2009). Illustration of source control methods for personalised sound field. Paper presented at Active 2009 Conference, . Fazi, F., Nelson, P. A., Potthast, R., & Seo, J. (2008). An introduction to a generalised theory for sound field reproduction. 139-148. 24th Conference on Reproduced Sound: Immersive Sound, Institute of Acoustics, Brighton, UK, 20-21 November 2008, . Park, M., Nelson, P. A., Fazi, F., & Kang, K. O. (2008). Application of an auditory process model for the evaluation of stereophonic images. Institute of Acoustics Spring Conference: Widening Horizons in Acoustics, Reading, UK, 10-11 April 2008, . Fazi, F. M., Nelson, P. A., Potthast, R., & Seo, J. (2008). Application of the theory of integral equations to the design of a multi-channel reverberation simulator. Paper presented at 35th Convegno Nazionale Associazione Italiana Acustica 2008, Italy. Holland, K. R., & Nelson, P. A. (2008). Applying inverse methods to distributed source regions. In Institute of Acoustics Spring Conference 2008: Widening Horizons in Acoustics (Proceedings of the Institute of Acoustics; No. 30, 2). New York, USA: Curran Associates. Nelson, P. A., Park, M., Takeuchi, T., & Fazi, F. M. (2008). Binaural hearing and systems for sound reproduction. 2nd ASA-EAA Joint Conference, (Acoustics '08), . Takeuchi, T., & Nelson, P. A. (2008). Extension of the optimal source distribution for binaural sound reproduction. In Spring Conference of the Institute of Acoustics 2008: Widening Horizons in Acoustics (Proceedings of the Institute of Acoustics; No. 30/2). Institute of Acoustics. Papadopoulos, T., & Nelson, P. A. (2008). Inverse filtering for binaural audio reproduction using loudspeakers: potential and limitations. In Proceedings of the Spring Conference 2008: Widening Horizons in Acoustics (pp. 277-284). St Albans, UK: Institute of Acoustics. Brunel, V., Fazi, F., Hörchens, L., & Nelson, P. (2008). Measurement and Fourier-Bessel analysis of loudspeaker radiation patterns using a spherical array of microphones. Paper presented at 124th Convention of the Audio Engineering Society, Netherlands. Fazi, F. M., Brunel, V., & Nelson, P. A. (2008). Spherical harmonic analysis applied to the reconstruction of the sound field radiated by a loudspeaker (abstract only). 2nd ASA-EAA Joint Conference (Acoustics '08), France. Delikaris-Manias, S., Papadopoulos, T., & Nelson, P. A. (2008). Subjective evaluation of inverse filtering in virtual acoustic imaging systems - inversion efficacy under optimal conditions. In Proceedings of the 4th Conference of the Hellenic Institute of Acoustics (pp. 472-482). Heraklion, Greece: Hellenic Institute of Acoustics. Politis, A., Papadopoulos, T., & Nelson, P. A. (2008). Subjective evaluation of the performance of virtual acoustic imaging systems under suboptimal conditions of implementation. In Proceedings of the 4th Conference of the Hellenic Institute of Acoustics (pp. 483-493). Heraklion, Greece: Hellenic Institute of Acoustics. Fazi, F., Nelson, P. A., Christensen, J. E. N., & Seo, J. (2008). Surround system based on three dimensional sound field reconstruction. Paper presented at 125th Audio Engineering Society, . Fazi, F., Nelson, P. A., Potthast, R., & Seo, J. (2008). The study of sound field reconstruction as an inverse problem. Institute of Acoustics Spring Conference: Widening Horizons in Acoustics, . Fazi, F. M., & Nelson, P. A. (2007). A theoretical study of sound field reconstruction techniques. Paper presented at 19th International Congress on Acoustics, Spain. Fazi, F. M., & Nelson, P. A. (2007). Analisi comparativa tra due tecniche di ricostruzione del campo acustico. Paper presented at 34th Convegno Nazionale Associazione Italiana Acustica, Italy. Brunel, V., Fazi, F., & Nelson, P. (2007). Misura e ricostruzione olografica del campo acustico generato da un altoparlante. Paper presented at Annual Meeting of the Italian Section of the Audio Engineering Society, Italy. Fazi, F. M., & Nelson, P. A. (2007). Sound field reconstruction: a comparison between different technologies. 1st SpACE-Net UK Workshop, United Kingdom. Fazi, F. M., & Nelson, P. A. (2007). The ill-conditioning problem in sound field reconstruction. Paper presented at 123rd Convention of the Audio Engineering Society, United States. Park, M., Nelson, P. A., & Kim, Y. (2006). An auditory process model for the evaluation of virtual acoustic imaging systems. 105-113. Paper presented at Institute of Acoustics Spring Conference 2006: Futures in Acoustics: Today's Research - Tomorrow's Careers, . Park, M., Nelson, P. A., & Kim, Y. (2006). An auditory process model for the evaluation of virtual acoustic imaging systems. In Proceedings of the 120th AES Convention Audio Engineering Society. Mannerheim, P., Nelson, P. A., & Kim, Y. (2006). Image processing algorithms for listener head tracking in virtual acoustics. 114-123. Paper presented at Proceedings: Institute of Acoustics Spring Conference, Futures in Acoustics, Today's Research - Tomorrow's Careers, Southampton, UK, 3-4 April 2006, . Holland, K. R., & Nelson, P. A. (2006). Minimising the number of microphones required for characteristics of distributed source regions. In ICSV13 CD-ROM Proceedings International Institute of Acoustics and Vibration. Nelson, P. A., Takeuchi, T., Rose, J., Papadopoulos, T., & Mannerheim, P. (2004). Recent developments in virtual acoustic imaging systems. In Proceedings of the 18th International Congress on Acoustics (ICA2004) (pp. 2183-2186). Japan: Acoustical Society of Japan. Papadopoulos, T., & Nelson, P. A. (2004). The effectiveness of cross-talk cancellation and equalisation of electroacoustic plants in virtual acoustic imaging systems. Paper presented at Institute of Acoustics Spring Conference 2004, . Zhang, X., Chen, X. X., Morfey, C. L., & Nelson, P. A. (2003). Acoustic radiation from a semi-infinite duct with a subsonic jet. Paper presented at 41st AIAA Aerospace Sciences Meeting, . Holland, K. R., & Nelson, P. A. (2003). Array processing in semi-reverberant spaces. Paper presented at 5th International Workshop on Microphone Array Systems, . Takeda, K., Zhang, X., & Nelson, P. A. (2003). Linearized Euler simulations of leading-edge slat flow. 1-10. Paper presented at 41st Aerospace Sciences Meeting and Exhibit, Reno, NV, USA, 6-9 Jan 2003, . Chun, I., Nelson, P. A., & Kim, J. T. (2003). Numerical models of miniature loudspeakers. Paper presented at Internoise 2003, Jeju, Korea, Republic of. Veres, G. V., Tutty, O. R., Rogers, E., & Nelson, P. A. (2003). Parallel global optimisation based control of boundary layer transition. Paper presented at European Control Conference (ECC'03), United Kingdom. Holland, K. R., & Nelson, P. A. (2003). Sound source characterisation: the focussed beamformer and the inverse method. In Proceedings of the Tenth International Congress on Sound and Vibration International Institute of Acoustics and Vibration. Chun, I., & Nelson, P. A. (2003). Virtual acoustic system with a multichannel headphone. Paper presented at AES 115th Convention, . Brind, R. J., Prior, M. K., Cazzolato, B. S., Nelson, P. A., & Joseph, P. F. (2002). Application of phase conjugate arrays to sonar. Paper presented at Institute of Acoustics Spring Conference 2002, Past, Present and Future Acoustics and EPSRC Theme Day in Acoustics, . Papadopoulos, T., & Nelson, P. A. (2002). Computationally efficient inversion of mixed phase plants with IIR filters.. Paper presented at 113rd Convention of the Audio Engineering Society, . Cho, Y., & Nelson, P. A. (2002). Least squares estimation of acoustic reflection coefficient. Paper presented at Institute of Acoustics Spring Conference 2002, Past, Present and Future Acoustics and EPSRC Theme Day in Acoustics, . Kim, J. T., Waters, T. P., & Nelson, P. A. (2002). Numerical modelling of vibration sources on hard disk drive by inverse methods. 127-136. Paper presented at International conference on Structural Dynamics Modelling, . Takeda, K., Zhang, X., & Nelson, P. A. (2002). Unsteady aerodynamics and aeroacoustics of a high-lift device configuration. Paper presented at 40th AIAA Aerospace Sciences Meeting and Exhibition, . Joseph, P. F., Fruteau, E., & Nelson, P. A. (2001). Design rules and sensing strategies for the active control of turbofan engine noise. Paper presented at 7th AIAA/CEAS Aeroacoustics Conference, . Takeuchi, T., & Nelson, P. A. (2001). Optimal source distribution system for virtual acoustic imaging. Paper presented at 110th Convention of the Audio Engineering Society, . Pitelet, C., Wright, M. C. M., & Nelson, P. A. (2001). Optimization of flow distortions for fan noise reduction with one-sided actuators. Paper presented at Proceedings of the 7th AIAA/CEAS Aeroacoustics Conference, . Takeda, K., Zhang, X., Ashcroft, G. B., & Nelson, P. A. (2001). Unsteady aerodynamics of flap cove flow in a high-lift device configuration. 39th Aerospace Sciences Meeting and Exhibition, . Rose, J., Nelson, P. A., & Rafaely, B. (2001). Variance of sweet spot size with head location for virtual audio. Paper presented at 110th Convention of the Audio Engineering Society, . Wright, M. C. M., & Nelson, P. A. (1970). Wind tunnel experiments on the optimization of distributed suction for laminar flow control. In K. Foster (Ed. ), Proceedings of the Institution of Mechanical Engineers: Combined Heat and Power - International Conference 11-12 October 1994 (pp. 343-354). UK: John Wiley & Sons, Ltd..
Papadopoulos, T., & Nelson, P. A. (2002). Computationally efficient inversion of mixed phase plants with IIR filters. (ISVR Technical Reports 297). Institute of Sound and Vibrartion, University of Southampton. Rose, J., Nelson, P. A., Rafaely, B., & Takeuchi, T. (2001). A study of virtual acoustic imaging systems for asymmetric listener locations. (ISVR Technical Report 295). Southampton, UK: University of Southampton, Institute of Sound and Vibration Research. Tutty, O. R., Hackenberg, P., & Nelson, P. A. (1999). Gradient projection methods for boundary layer transition control. (ISVR Technical Report; No. 284). University of Southampton. Takeuchi, T., & Nelson, P. A. (1999). Robustness of the performance of the "stereo dipole" to head misalignment. (ISVR Technical Report; No. 285). Southampton, GB: University of Southampton. Yoon, S. H., & Nelson, P. A. (1998). A method for the efficient construction of acoustic pressure cross-spectral matrices. (ISVR Technical Report; No. 281). University of Southampton. Yoon, S. H., & Nelson, P. A. (1998). Estimation of acoustic source strength by inverse methods: Part I: Conditioning of the inverse problem. (ISVR Technical Report; No. 278). Southampton, GB: University of Southampton. Yoon, S., & Nelson, P. A. (1998). Estimation of acoustic source strength by inverse methods: Part II: Methods for choosing regularisation parameters. (ISVR Technical Report; No. 279). Southampton, GB: University of Southampton. Yoon, S. H., & Nelson, P. A. (1998). Estimation of acoustic source strength by inverse methods: part III: experiments. (ISVR Technical Report; No. 280). Southampton, GB: University of Southampton. Tavan, D., Mannerheim, P., & Nelson, P. A. (2005). An investigation of the design and implementation of cross talk cancellation filters for virtual acoustic imaging. (ISVR Technical Memorandum; No. 951). Southampton, GB: University of Southampton. Rose, J., & Nelson, P. A. (2005). Time domain source signal reconstruction using beamforming techniques. (ISVR Technical Memorandum; No. 948). Southampton, GB: University of Southampton. Sors, T. C., & Nelson, P. A. (1997). Discrete time LQG feedback control of vibrations. (ISVR Technical Memorandum; No. 815). Southampton, GB: University of Southampton. Yoon, S. H., & Nelson, P. A. (1997). On the condition number of the matrix to be inverted in an acoustic inverse problem. (ISVR Technical Memorandum; No. 817). Southampton, GB: University of Southampton.